It's time for Sunday Supper, y'all! I am a beer aficionado. I drink beer. A lot. I even have an app for that. I spend a lot of my free time at the oldest brew pub in my city and researching what beer I should drink next. 8 out of 10 women I meet "don't like beer" or "don't drink beer" and that bothers me a little bit. OKAY--it bothers me a lot. There is a beer for EVERYONE. Whether it be an ale, lager, stout, porter, sour, lambic, or a beer cocktail--there is something for everyone to enjoy. It's just like water. Water with hops, grain or fruit and yeast in it. That being said, I think I've come up with an idea that will turn any red-blooded person into a beer lover. 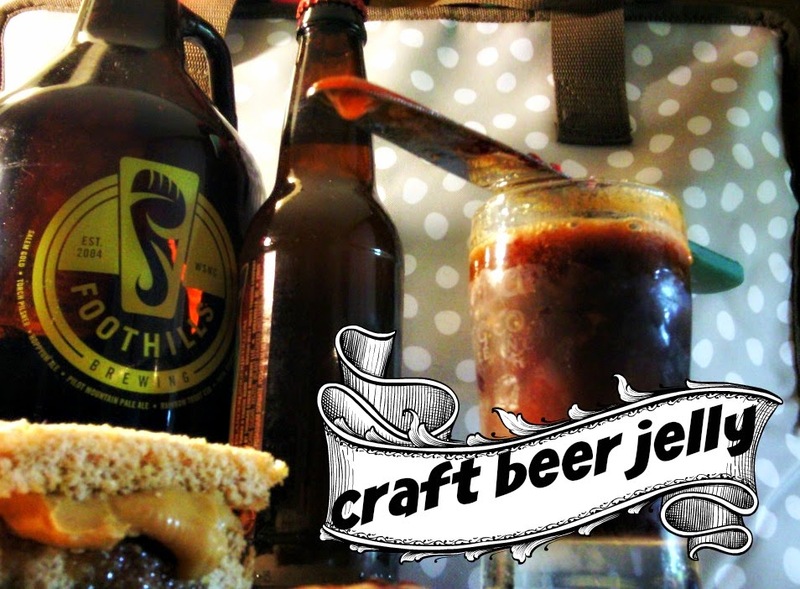 I've turned beer from my favorite brewery in North Carolina into [DRUMROLL] Craft Beer Jelly. It MUST be jelly 'cause jam DON'T shake like that! Craft beer is beer produced in a microbrewery that produces a small amount of beer. The exact terms vary, but typically breweries that are much smaller than large-scale corporate breweries and are independently owned fall under this category. Craft beer is characterized by emphasis on quality, flavor and small-batch brewing techniques. In North Carolina, anything that produces less than 50,000 barrels of beer a year is considered a microbrewery. There are a little more than 2 kegs in a barrel and a little more than 15 gallons in a keg. When the topic of libational recipes came up for #SundaySupper, I had no other ideas except to make jelly from beer. I've heard urban legend about this stuff and I wasn't sure I could pull it off. My first thought was to use a light lager because it's pretty, golden and yellow but then I said,"Screw that. I'm going for flavor." I used a porter which is similar to a stout. Normally, I don't like porters or stouts. At all. I don't care for beer that tastes malty, caramelly, or like drinking chocolate or coffee. Sometimes you have to take one for the team for the good of the collective and trust me--this is VERY GOOD. When you pour the hot jelly into your jars, there will be a little foam and it will look like a simple glass of beer. You can skim off the foam, but I think it looks a little more authentic this way. 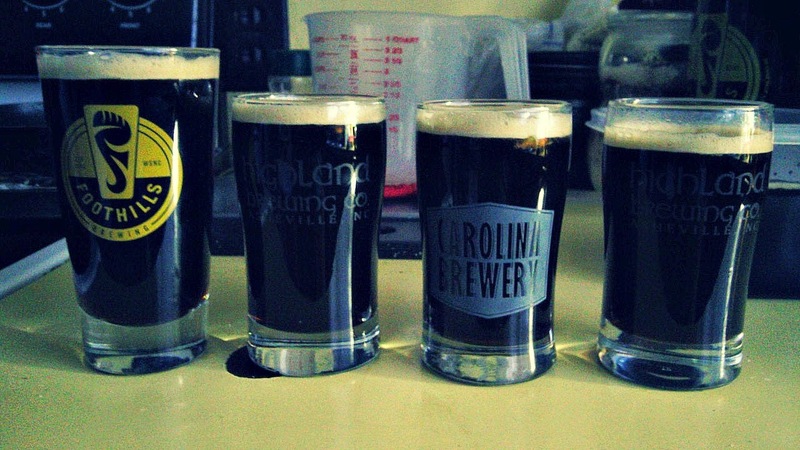 I used sample glasses from a couple of my favorite NC breweries to make the jelly. You can use any kind of jar or glass you like. Also, using jar lids isn't necessary. Just as long as your vessel is clean and sterilized, you should be good. It's sweet, with a little tang from added lemon juice with the beer flavor hitting your taste buds in the back and finishing with a light alcoholic lift with lots of malty flavor from the beer. So what do you put it on? I'm sure you've been asking yourself that for the past minute or so. Well, it's perfect to spread on your favorite sandwich bread with peanut butter or even hot, buttery biscuits fresh from the oven. You could also put it on pork, chicken wings, or even toss it with fried shrimp for a Bonefish Grill Bang Bang Shrimp kind of situation. If you're in the mood to collect more boozy recipes from a talented group of people, check out nearly 4 dozen recipes from the Sunday Supper crew from around the web. In a large stock pot bring the beer to a boil, then lower the temperature so the beer is just barely simmering. Add sugar one cup at a time, stirring to make sure each cup has fully dissolved before adding the next cup. Once sugar is dissolved, add pectin and bring back up to a boil and let cook for 3 minutes. The beer will roll and foam. If need be, remove from the heat periodically so the pot doesn't boil over. Add lemon juice and pour into warm sterilized jars or glasses. Clean up rims and place on lids, if using. Loosely tighten bands so they will hold but will not leak, turn jars upside down for 15 minutes. After 15 minutes has passed turn jars right side up and let finish cooling. If not using lids, simply let the jars cool and cover tops with wax paper and seal with string for gifts. If the jelly doesn't jell, simply re-heat jelly until simmering and add half a pouch of pectin and 3 more tablespoons of lemon juice. Re-jar and so forth. I have a few friends who enjoy craft beer and I think this would be a great gift for them. You would fit in well with my family. The men are all beer lovers...and my husbands group makes sure there is beef available at their staff meetings :) I have a feeling they'd love this jelly! I have never seen this before, great recipe, I love it!! I love every kind of beer, dark brews are my favs though. This is must try recipe for me Nikki! Fabulous idea and very creative. And a great gift for my beer loving friends. Yup, I'm "one of those". I just don't like beer, but I totally agree with what you said, I know there's one out there that I'd like. Happy Holidays to you and your family. You are one clever beer-loving cooking / baking lady, Nikki. Thank you for the education in America's beloved beverage. Stout does seem to be the perfect choice for jelly =) Thanks for the recipe! This is so incredibly unique, I have to try it for sure! And that......is pretty much amazing. NOVEL idea--my beer-lovin' friends are going to love this one! This is one of the more unique food gifts I've ever seen or heard of! My beer-loving hubby would go NUTS for this! And I would too, I'm one of the 2 in 10 women you meet. Confession - I used to be one of the 8 in 10, but when I started dating my now-husband, and decided I'd like to continue being with him, liking beer became a matter of survival, lol! Oh my! This is heaven!! Nik, you're a genius! My hubby loves all kinds of draft beer, it's a great idea as a gift! So unique! My hubs would love this. What a creative recipe for a craft beer lover. I would have never expected lemon juice and beer to go together, but then I never would have expected beer jelly either. What an unexpected (and fun) surprise. I love the idea of using this on pork or wings - but you know I'm dying for a pb&j sammich using it! This sounds amazing, I totally want to try it. My hubby would love this, he's such a big craft beer junkie!! Beer research? I'm in! I live in North Carolina so I am going to have to go looking for this beer! We came across some imported American craft beer today at something like Costco. Only $4-6 a bottle! We passed. ;) But if we had some, this looks like a great use of it! This would be a dream for my husband. Making it soon! Here is some information about me - I am German; born and raised but when I lived in Germany beer was not my favorite. Now twenty some years later I live in Portland, Oregon where craft brew is every where and I love beer. Well, I should say most - wine remains my other preferred beverage but yummy beer. I've never seen Craft Beer Jelly! Love this! I've never seen craft beer jelly before! This looks amazing! "It MUST be jelly 'cause jam DON'T shake like that!" Bwahaha! I have GOT to try this jelly! This sounds amazing! I had no idea you could make jelly out of beer...yum! Oh my! I didn't even know Beer Jelly existed! Oh and what a fantastic idea to put the jelly in beer glasses! Have you ever tried Abita Purple Haze? It's really refreshing. Didn't know you could make jelly from beer. Learn something new every day! Did anyone actually try and make this, of those that commented? I am trying and not sure it is setting. Liquid in jars. It's been an hour since I sealed them up. Wondering if I just wasted a bunch of nice homebrew, organic sugar, and organic lemons. I just made this.... the jars have a nice "head" on them. When I turned upside down they got mixed up, so I decided to chill them right side up..... it smells great! I added 1/4 c apple cider vinegar and used "pamonas universal pectin" that I found at Whole Foods. I used Shock Top beer.... I'll give it a try in the morning. Do I put it in the fridge after it's cooled? I'm going to leave it out until I open it to test. It sure looks gorgeous, just don't turn upside down, this mixes up the "head", unless I should let the "head" settle before I cap them.... this is my first time making anything like this.... they are literally still warm. We'll see.... I want to give them as Christmas gifts. Thanks for the recipe!!! I maade this yesterday and it is SOOOOO good! I can't believe it! The "foam Head" on top, gives it a festive look and makes it really look like a beer! The flavor, I used Shock Top, is amazing! I put it on some smoked chicken and it was amazing! Sounds weird and strainge, but it is fun and exciting!!! Thank you!! Made this recipe...just as you said at the end of your recipe...it did not set. So I then followed your recommendation to fix it. It set, but has no flavor now as a result of being boiled twice.